An organized home is something I almost crave. Does that sound crazy? I don’t know…when our house is organized I’m just a happier and more relaxed person. An organized home takes some time to get it there, but once you do, you’ll have more time for the things you enjoy. 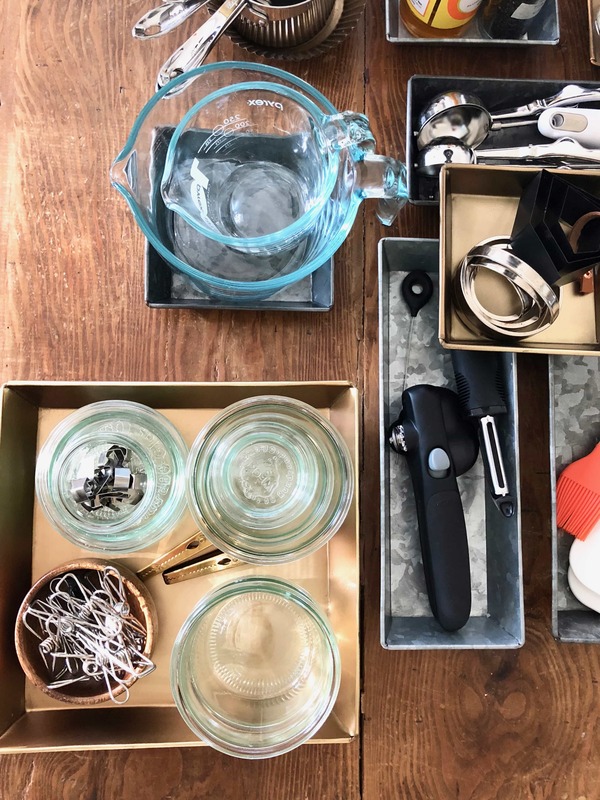 I took some cues from the newest Remodelista book, The Organized Home and realized that organization is beautiful. Or it least it can be beautiful, especially if you don’t use plastic. That’s a tough one in the kitchen, but I’m trying! I always says this, but it really is the little things, right? I started using these trays from Terrain for organizing things in bathrooms and one on Madeline’s desk. I loved them so much I decided to organize the kitchen using them. 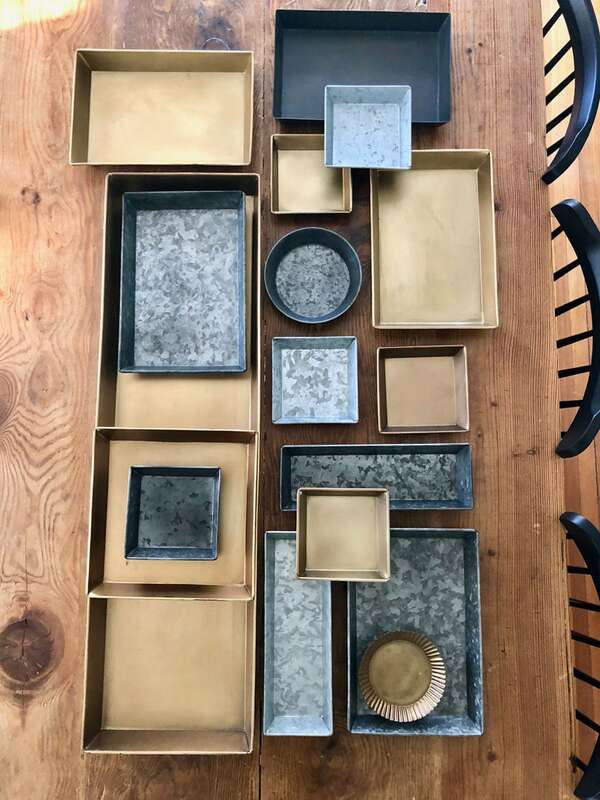 I used a combination of trays made by Habit + Form in brass and zinc. 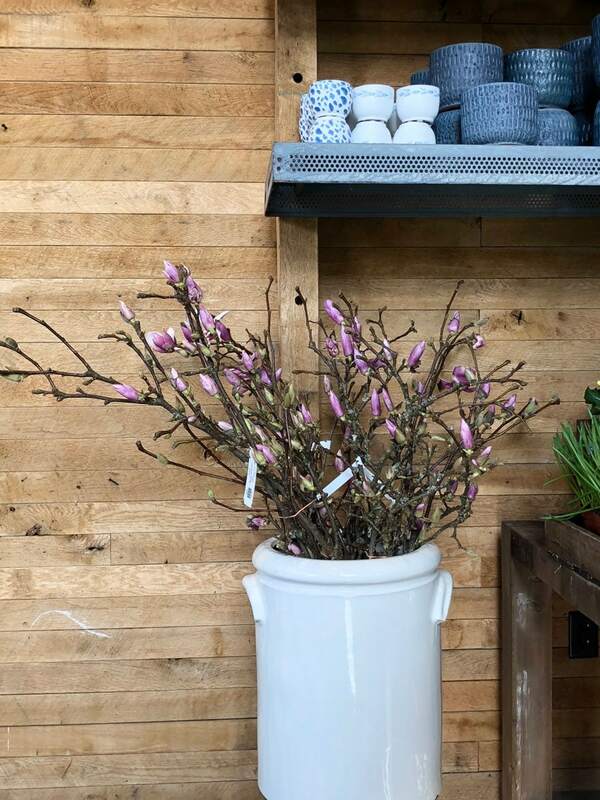 They come in several shapes and sizes and are perfect for every shelf and drawer in the kitchen. 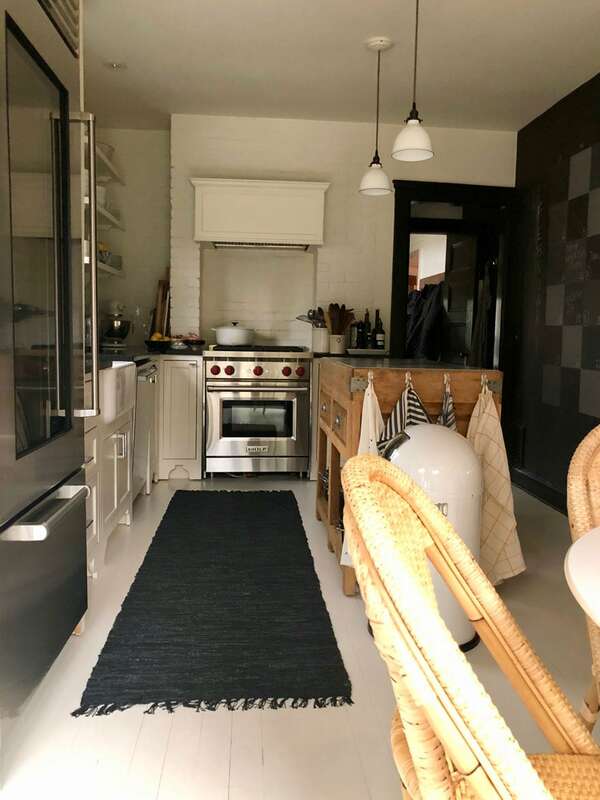 As with all projects–even one as simple as organizing the kitchen, it leads to another project: finding the perfect runner for the kitchen. When we renovated our kitchen we tried to have floors that matched the rest of the house, but that proves to be a difficult task when the house was built in 1900. Should have gone with cement tiles, but we didn’t so I’ve been on the search for the perfect runner. When buying trays at Terrain I discovered the perfect one! It’s the leather cotton weave in black, of course! Found the perfect runner at Terrain. Organization takes on a whole new meaning when using beautiful trays from Terrain. The Remodelista book talks a lot about using things that you already have to organize. I love that idea and try to do that when possible. I use my McCoy small planters in my desk and re-purposed jars to hold art and craft supplies in my workroom. I broke the “use what you have rule” when buying an armload of trays at Terrain, but I’ll have them forever and can use them for ton of things around the house. Like at the holidays when I used this one for Advent candles. What would you use them for? You can find everything on my SHOP pages, here and here. I don’t love housework, but I do love tidying (organizing). 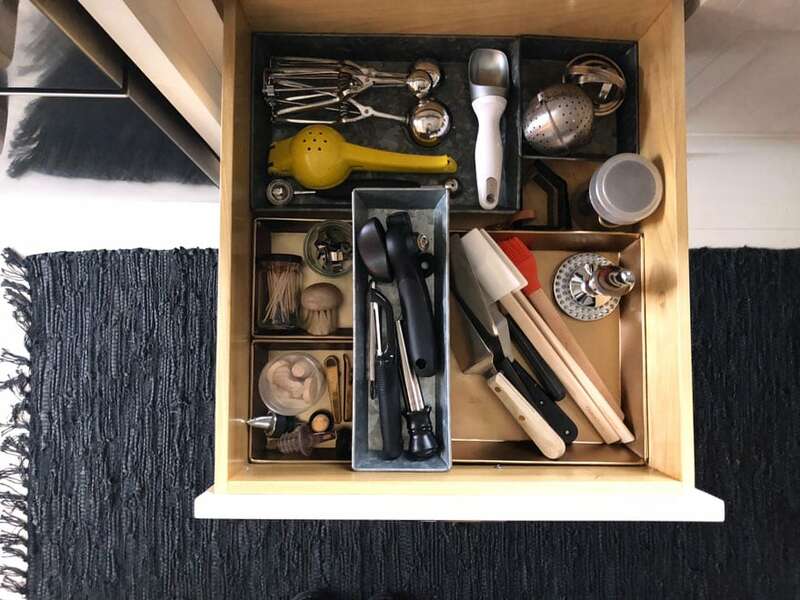 Recently I re-organized several kitchen drawers and the pantry. We have more than enough storage space but I fight letting it become a storage graveyard. I repurposed two bread tins that sadly never see use. I didn’t want to get rid of them so now they hold my spice jars neatly in a drawer. I try to use what I already have too like a wooden tray painted, for me, by my then toddler. I’m sentimentally attached so now it holds odds and ends in the utensil drawers. Yours is my favorite blog for how you combine style and efficiency. Form and function. I agree with Marianne………. I don’t love housework either but 10 minutes of tidying and I can find happiness! 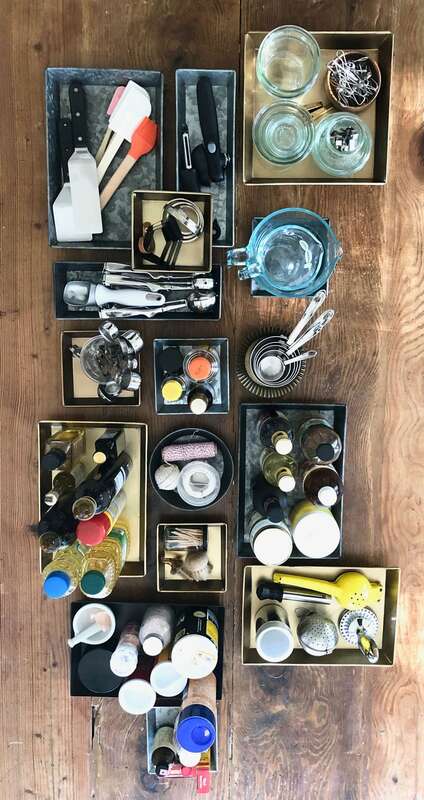 I love seeing your “curated” cooking equipment all neat and tidy in their little containers. You have inspired me to go through my drawers and cabinets this weekend. I agree! Housework is always a chore, but tidying up is the fun part! Marianne, housework is ALWAYS a chore, but organizing and tidying is a fun task! I love that you re-purposed bread tins to organize your spices and a hand painted tray with so many memories to hold odds and ends. I imagine that every time you open your utensil drawer, it brings a smile! Thanks for reading and for your kind words! OKAY……..off to clean and organize!!!!!!! I love the organizing part…the cleaning, not so much! Thanks for reading! I don’t k ow why, but I am not receiving any of you ur newsletters, etc. I have not set up automatic emails when I have a new post. It’s something I’m considering and will probably implement soon. Thanks for reading MLT and for taking time to comment.